I’ve been working with Dorota Glowacka of University of Helsinki on a search system built on the ArXiv.org. We have a demo appearing in SIGIR 2016. Here is a model with 100 topics built using normalised gamma priors on topics (giving each topic a variance parameter as well as a mean parameter) on the 1.1 million abstracts to March 2016. The model took about 6 hours to run on my desktop. and then zoom around to view. Finally decided to write a proper visualiser for topic models. I used the WordCloud Python tool from AMueller[GitHub]. Modified it because the input I needed to use words with precomputed scores, rather than text input. Moreover, I wanted two dimensions for words displayed, size (word frequency in topic) and lightness (degree to which the word is characterised by the topic, measured as frequency over document frequency). I also scale the final tag cloud depending on the size of the topic in the corpus. The correlation between topics is computed from the document-topic proportions. All these then go into GraphViz, where nodes are displayed as images and a lot of careful weighting and organising of the number of topic correlations to display, edge weights, etc. Obesity in the Australian news (from ABC website 2003-2012). Attended a great workshop at CIKM 2015, Topic Models: Post-Processing and Applications, and gave a talk. Surprisingly good quality papers for a workshop of its kind so learnt a lot. My talk was better motivating and explaining some of the features of our non-parametric system that lets you diagnose topics: CIKM15 TM talk, Buntine. The talk I gave at JSI (Jozef Stefan Institute in Ljublana) on 14th Jan 2015 was recorded. The group here, with Dunja Mladenić and Marko Grobelnik, are expert in areas like Data Science and Text Mining, but they’re not into Bayesian non-parametrics, so in this version of the talk I mostly avoided the statistical details and talked more about what we did and why. The talk is up on Video Lectures. The original PDF of the EU talk sequence was on this post. I visited Ralf Herbrich’s new Amazon offices in Berlin on 8th January and chatted there on topic modelling. A pleasant result for me was meeting both Cédric Archambeau and Jan Gasthaus, both having been active in my area. With Cedric I discussed Latent IBP compound Dirichlet Allocation (in the long awaited IEEE Trans PAMI 2015 special issue on Bayesian non-parametics, PDF on Cédric’s webpage) model which combines a 3-parameter Indian Buffet Process with Dirichlets. This was joint work with Balaji Lakshminarayanan and Guillaume Bouchard. Their work improves on the earlier paper by Williamson, Wang, Heller, and Blei (2010) on the Focused Topic Model which struggled with using the IBP theory. I’d originally ignored Williamson et al.s’ work because they only tested on toy data sets, despite it being such a great model. The marginal posterior for the document-topic indicator matrix is given in Archambeau et al.s’ Equation (43) which they attribute to Teh and Görür (NIPS 2009) but its easily derived using Dirichlet marginals and Lancelot James’ general formulas for IBPs. This is the so-called IBP compound Dirichlet. From there, its easy to derive a collapsed Gibbs sampler mirroring regular LDA. Theory and sampling hyper-parameters for the 3-parameter IBP I describe in my Helsinki talk and coming tutorial. This is a great paper with quality empirical work and the best results I’ve seen for non-parametric LDA (other than ours). Their implementation isn’t performance tuned so their timing figures are not that indicative, but they ran on non-trivial data sets so its good enough. 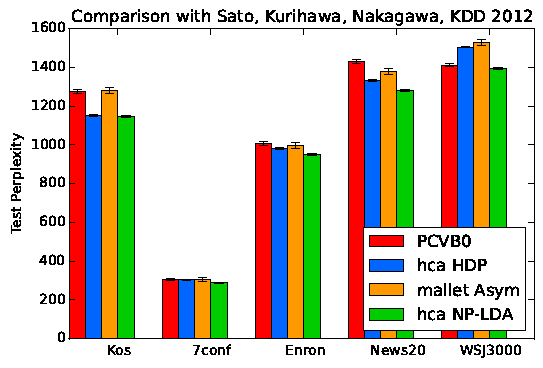 They compared against prior HDP-LDA implementations so of course beat them substantially. Our version of HDP-LDA (without burstiness) works as well as their LIDA algorithm, their better one with IBPs on the topic and the word side, and is substantially faster. Our fully non-parametric LDA (DPs for documents, PYPs for words, no burstiness) beat their LIDA substantially. So while we beat them with our superior collapsed Gibbs sampling, their results are impressive so I’m excited by the possibility of trying their methods. Version 0.61 just posted. I’ve been adding some integration to make the diagnostics more useful. Plus a few corrections to sampling. Really need to clean up the code though. uuuggghhh!